—-Bayard Rustin, Civil Rights organizer and close contemporary of Martin Luther King, Jr. In the grand historical arc of the human struggle for justice, we find ourselves observant of the cycle of destruction and creation. This is the “creative trouble” of which Rustin speaks, which was embodied in the work of those like Dr. King. In our moment, we are surrounded by words launched into the core of our society and threatening the parts of our world that are married to the marginalization of others. This dissension of injustice disturbs and, indeed, destroys. In these sometimes frightening moments, we must know what Rustin, Dr. King, and so many of us today understand: the truth destroys to usher in the possibilities of a liberated future. This knowledge means the subsequent dialogue will be grounded in this same truth. Our dialogue will be fertile soil for a world that welcomes and embraces those previously denied because we began building on an awareness of structural violence and systemic oppression. This is why words matter. This is why “creative trouble” is necessary—-because as we speak the liberating words and heed their clarion call, we hone ourselves into instruments capable of a harmony that does not request half the choir’s silence. Rebounding between the realms of destruction and creation, we find the conduit from dissent to dialogue, honoring every step of the process. Duke will join Durham Tech, N.C. Central University, the Rotary Club of Durham and Duke School to bring 100,000 meals to the Triangle. Volunteers will package rice and bean casseroles and macaroni and cheese meals to fill the shelves of pantries in the Triangle area. All food items will be distributed by the Inter-Faith Food Shuttle and their partner agencies working to end hunger in seven counties. Note: The MLK Meal Packaging event is now at capacity and is no longer accepting sign ups. 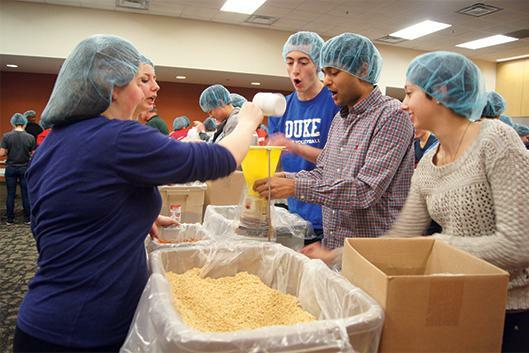 On Jan. 21 Duke will join Durham Tech, N.C. Central, the Rotary Club of Durham and Duke School to bring 100,000 meals to the Triangle. 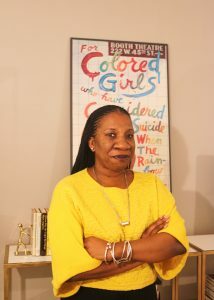 Burke, the senior director at Girls for Gender Equity, coined the phrase “me too.” in 2006 to raise awareness of the pervasiveness of sexual abuse and assault in society. It grew into a broader movement following the 2017 use of #MeToo as a hashtag after the Harvey Weinstein sexual abuse allegations. The public is invited to the annual program, which will link King’s civil rights legacy to the continuing struggle for equity and justice in all facets of our society. The commemoration event starts at 3 p.m. in Duke University Chapel, and free parking is available in the Bryan Center Parking Garage (see map at http://myatlascms.com/map/?id=21&mrkIid=39570). TIME Magazine named Burke, among a group of other prominent activists dubbed “the silence breakers,” as the Time Person of the Year for 2017. Additional campus events include a talk by writer and civil rights activist Shaun King at 7 p.m. Wednesday, Jan. 23, in Reynolds Theater. King is noted for his use of social media to promote social causes, including the Black Lives Matter movement, and is a columnist for The Intercept. Previously, he was a contributing writer for Daily Kos and a political commentator for The Young Turks. He co-founded the Real Justice PAC in February 2018, which supports progressive candidates running for district attorney offices. All tickets to Shaun King’s talk have now been claimed.